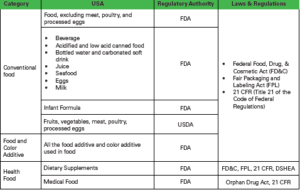 • FDA regulates both domestic and imported foods, except meat and poultry and processed eggs. • USDA regulates all the fruits, vegetables, meat, poultry and processed eggs. • Any substance that is Generally Recognized As Safe (GRAS) for a particular user may be used in food for that purpose without pre-market approval from FDA. • A GRAS determination must reflect the views of experts qualified by scientific training and experience to evaluate the safety of substances directly or indirectly added to food. • Those expert views must be based on “scientific procedures,” supplemented in the case of substances used in food prior to 1958 by experience based on common use in food. • According to 21 CFR, the term “safe” means that there is reasonable certainty in the minds of competent scientists that a substance is not harmful under intended conditions of use. Safety assessment of food and color additives used in food and to assist petitioners in developing and submitting toxicological safety data.